These pages were written by Simon Linder and Lars Dolling. Thanks to Kajo Jung, who is hosting these pages now at the the Reservisten-Server. I spent about nine months on "S61 Albatros". This is an fast patrol boat with the type designator PGF (which means "fast patrol boat with guided missile"). 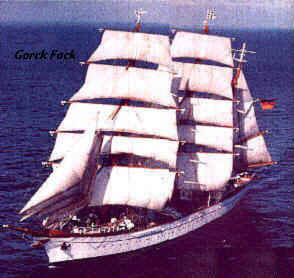 I have been for nine months on "F214 Lübeck", a fast frigate with two helicopters. 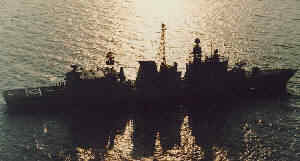 During my time on the "Lübeck" I have taken part in operation "Sharp guard" (UN embargo control of Yugoslavia in the Adriatic Sea) for 3 month, for example. Cool images like a launching Exocet missile! these images are the only WWII related informations at our pages! btw if you're looking for the address of a former German soldier you've met before and you want to see him again, try it at the addresses on that page. There is a naval FAQ (it's mainly for the military newsgroups). Maybe it's useful for you. This page got hits since 10th of May. Last update: 8/02/98 - What's new?